aspect of our mission at SDBB. Our generous financial and blood donors support lifesaving blood services and medical research to advance health and wellness. Learn more about philanthropy’s impact – click here. Bryan was hit by a truck while riding his bike to work in May 2011. His life was saved by emergency surgery that required multiple blood transfusions. Bryan is a financial supporter, SDBB volunteer, and a grateful patient who experienced first-hand the impact of eight anonymous blood donors who saved his life. Kamila has beta thalassemia major, a severe form of anemia that requires transfusions every three weeks for the rest of her life. Her first blood transfusion occurred when she was just two months old. It’s because of the SDBB community that Kamila can live a happy and healthy life and enjoy her childhood. Mercedes required regular transfusions to keep her healthy after being diagnosed with leukemia. She is so grateful to the blood donors who kept her healthy while waiting for her successful bone marrow transplant. Mercedes is an ambassador for SDBB and is proud to share her experience and promote blood donation - the gift of life. Max was born prematurely and became anemic due to a rare blood type incompatibility. He required a blood transfusion after being diagnosed at Rady Children’s Hospital. 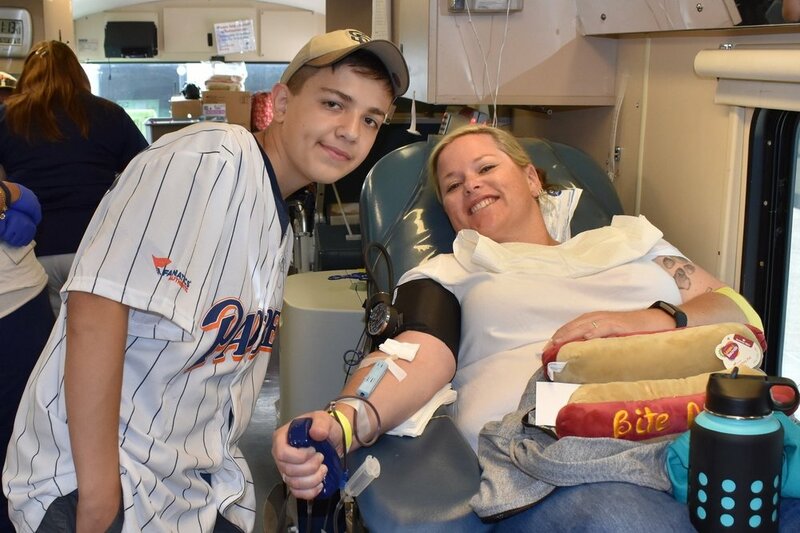 Max and his family are grateful to SDBB and all of those who donate blood. Aidan has been saved by blood donors since he was born. After a heart transplant at four, blood drawn for testing more than 500 times and more than 730 days spent in the hospital, Aidan is now thriving as a budding guitarist and surfer. You may see Aidan at SDBB donor centers and events thanking blood donors for their generosity. Gabriella “Ella” is dependent on blood transfusions every three weeks due to a rare form of anemia – beta thalassemia major. She has been receiving transfusions at Rady Children’s Hospital since she was a baby. Ella and her mother are SDBB ambassadors who regularly share their gratitude at signature events and blood bank tours. was once considered medical waste. Clinical and Translational Research Institute to conduct studies related to diabetes, cancer and more. helps research and development company teams to test new medical devices related to blood products for both clinical and research use. collaborates with a genetics-based company that developed an assay to screen men for prostate cancer risk. A Cell Therapy lab technician processes a cord blood unit at our Gateway Lab. SDBB is a primary cord blood provider. We collaborate with San Diego and Southern California hospitals to collect umbilical cord blood after the birth of a healthy full-term baby. SDBB is pioneering an umbilical cord tissue bank — a breakthrough for the aging population. In collaboration with academic, biopharmaceutical and clinical research and development organizations, the establishment of San Diego Blood Bank’s cord tissue bank will enable research and development of new cell therapies in regenerative medicine for age-related disorders. SDBB produces a product called Clearsate™ (Human Platelet Lysate) used by researchers to, for example, grow cells for basic and clinical research efforts to develop new therapies for age-related disorders and cancer. Pictured left, platelet agitators dissipate clumps in preparation for the next stage of filtering for Clearsate™ production. provider for Rady Children’s Hospital. Team Patient Survivors, Ella and Kamila, receive regular blood transfusions together at Rady Children’s Hospital to keep them healthy despite their beta thalassemia major diagnoses. saw an average of 4,000 blood donors. donated more than one million dollars to give the gift of life. Financial gifts supported blood collections, mobile blood drives and cell therapy research. Philanthropy helps to pioneer the next era of cell therapy and precision health. Donated white blood cells are collected for research to develop anti-cancer vaccines. Philanthropy that supported blood donations, bloodmobiles and cell therapy research impacted more than 485,823 lives in a year. SDBB processes blood components known as “buffy coats” used to develop cancer vaccine research. SDBB collaborated with more than 100 clinical and research partners on the design and execution of basic and clinical research efforts related to cancer, regenerative medicine and general health. From validating liquid biopsies and other blood-related diagnostic tests, to supporting cell therapy clinical trials for prostate cancer and melanoma, SDBB continues to be a national blood bank leader in advancing wellness and the future of health. During the holiday season, blood supplies drop to critical levels across the country. The San Diego community, alongside the Padres, Gulls, Holiday Bowl and many other valued partners, came together to ensure a safe blood supply for our neighbors. The single-day event on December 16, 2017, collected 537 units of precious blood. With high schools and colleges out of session, the summer months are a challenge. In June 2018, the Padres stepped in to ensure supplies were steady for our community. This single-day drive collected 347 units and saw 107 first-time donors!